Hello to the official Michigan Ballroom Dance Team for Fall 2018!!! Our roster for the semester is now complete and I want to extend the warmest of welcomes to the newest members of the MBDT 🙂 I am so excited that you are all joining our community and hope everyone had a fantastic Guys’ and Girls’ Night, whether it was your first time or last of many. I know I thoroughly enjoyed getting to know you all better, dancing with my fellow ladies and beating the guys in the dance off (in my totally unbiased opinion at least), and celebrating the start of a great semester together! What is Week at a Glance??? I’m glad you asked! Week at a Glance (WAG for short) is our weekly newsletter containing information about all our upcoming events for the week, including lessons, practice space, socials and much more! Week at a Glance is your best source for all things MBDT, so please take the time to read through it thoroughly to ensure you don’t miss out on our events. Our lesson and practice schedule sometimes deviates from normal to accommodate special events, so please check the schedule below before turning up at the CCRB! Lessons this week: After our SAPAC workshop on Tuesday (more info below), weekday review lessons will start on Thursday this week with a review of last Saturday’s lesson (9/22). If you didn’t make Saturday’s lesson you can catch up on what you missed, but this is also a great opportunity for everyone to ask more detailed questions from your student teachers and get more comfortable with your cool new cha cha, foxtrot and swing moves! Join our Facebook group! It’s the hub of our community where we post event reminders and announcements during the week. Check it out here, and just hit request access. Bronze American lesson: Get ready for fall competitions by learning some new American moves! This lesson is open to anyone on A through Pre-C teams. If this applies to you, you’ll have received a separate email about this last week, please fill out the form in the email ASAP to let David know if you’re coming! Our mandatory Sexual Assault Prevention and Awareness Center (SAPAC) workshop is this Tuesday at 9pm in CCRB 3275. In this short interactive workshop, we’ll be talking about consent, bystander intervention strategies, and how to promote the safe and respectful culture that our team is known for. This is required for everyone on the team, even if you completed the workshop last year. This is a requirement for attending future social events, and attendance will be tracked. We know this is short notice, so there will be a makeup opportunity available: if you are unable to attend, please email me (Lizzie) by replying to the WAG email (unless you’re on B-team, since we know you’ll be at lesson). Illinois competition is coming up soon! If you’re new to the team, don’t worry about this one as there will be lots more opportunities to compete later in the semester. If you’re interested in attending but not sure what to expect, send your questions to our away competition chair Fabiola (fabiolga@umich.edu). For everyone else who is planning on going, fill out the O2CM registration and the Rooms and Rides form below. Remember to pay your registration directly to the team, don’t pay on O2CM! Invite one of your new team friends for coffee! Your ballroom team membership comes with a FREE membership to the ballroom club! Just ask the desk at the club for your membership card. 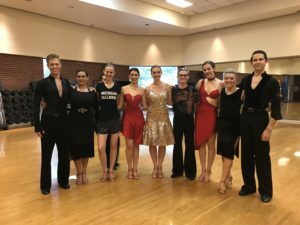 The Ballroom Dance Club meets once a week on Sundays and provides a relaxed, social environment to learn ballroom for the wider Ann Arbor community. 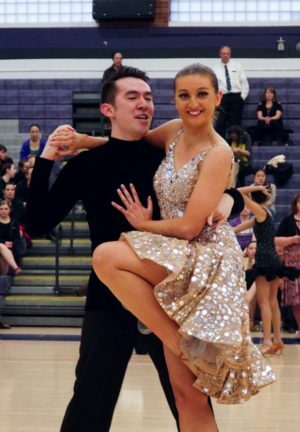 It’s a great opportunity to attend an additional lesson (if the two this week weren’t enough) and get some help from upper-level team members at Open Dance. Club is in the League ballroom this week.